Yesterday’s gap up (rising window) in spot silver prices has given us a strongly bullish signal for two reasons. First the gap up in itself is an indication that the move has bullish momentum but secondly and, perhaps more importantly, the price of silver hurdled a key resistance level on the silver chart at the $14 per ounce price point. Both these factors combined to provide clear evidence of bullish market sentiment, and indeed this view is confirmed by the 9 day moving average which has now crossed above the 40 day moving average with the 14 day moving average about to follow suit. Trading in silver is very much a dollar play at present and one of its main drivers along with continued positive risk appetite by traders and investors who are buying into equities and commodities who seem to think that we are back to the heady days of 2004 when the world economy was growing at 5% per annum. 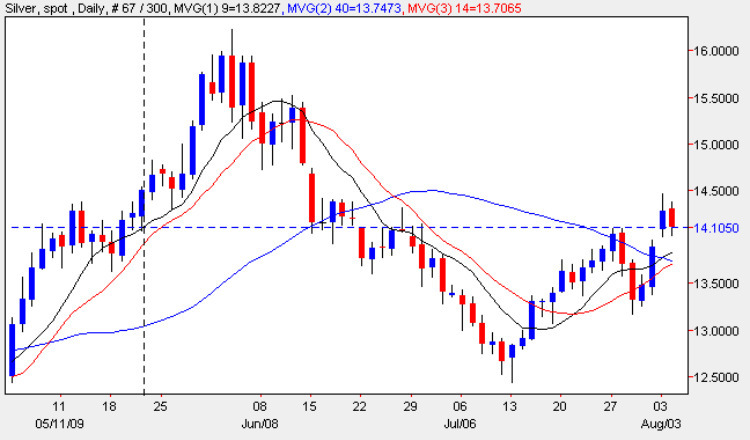 While this market mood persists then spot silver prices should continue to climb.